A single entry blog about Bill taking his family down to Disneyland and the golfing adventures along the way. Family vacations are great on a variety of levels; they build relationships, teach patience, and give me a chance to sneak in some golf at courses I�ve never played. During the winter I grow tired of the cold weather in Pocatello and scheme about what warm destination I could retreat to. One winter day while I was sitting in my basement dreaming of warmer weather, I called my timeshare company on a whim to see if they had any Southern California condos available to trade for a family of my size. The gal on the other end of the phone seemed stunned to discover a two bedroom unit right on the beach in San Diego, �I never see two bedroom units available in San Diego,� she proclaimed, �you ought to jump all over this.� So I did. It wasn�t going to take much of a sales pitch to talk me into leaving Idaho for a week and enter the perfect weather of San Diego, plus Stacy�s sister lived there and it would make it easier for me to escape to the golf course if she had her sister to hang out with. Lastly, we had talked with my parents for the last few years about going to Disneyland together so they could enjoy it with some of their grandkids. A couple of months before we left for California, my Dad received a call from Salt Lake City. When you are a member of The Church of Jesus Christ of Latter-Day Saints (LDS � Mormon) and a call from the church headquarters pops up on the caller ID, you answer the phone with both excitement and fear not knowing for sure what conversation lies ahead. The secretary of one of the 12 apostles was contacting my Dad and wanted to have an interview with him and my Mom via satellite. During the interview they discover that they are being asked to serve a mission president�s over one of the 300+ missions the LDS church runs worldwide. The calling is for three years and they won�t know where they are being assigned for at least three more months. Well, the day before we took off for San Diego they received their mission call in the mail. They were informed they would be going somewhere English speaking and were provided with a lengthy list of possibilities. Before they opened up the large white envelope, all of us kids wrote down two destinations; the place we WANTED them to go as well as the place we THOUGHT they would go. When it came to my turn to unveil my locations I let them know that I wanted them to go to Edinburgh Scotland so that I would have an excuse sometime during the next three years to go golf at St. Andrews. My guess of where I thought they would go was Atlanta, GA since it was near where my Dad�s ancestors were from. Well, one of my guesses was right � they were off to the ATL. While Atlanta isn�t the golf destination that Scotland is, Atlanta is full of great courses and beats the heck out of being called to serve in the North Dakota mission. My Dad was pretty concerned about being called to serve in a large city and Atlanta certainly fills that bill. Having served my mission in Houston I assured him that the church would provide him living quarters well outside the heart of Atlanta is a nice suburb. You also have to understand, my Dad HATES traffic. If he has to wait for 60 seconds at a stop light, it is about 50 seconds too long. So heading down to the hustle of bustle of Atlanta was a bit overwhelming. But we soon discovered that he would be staying in Peachtree City, 45 minutes south of downtown, is a quaint little community that features hundreds of miles of golf cart paths and is the encouraged form of transportation when running short errands. With that, it was time to load up and head to sunny California so that my parents could enjoy a couple of days of fun with their grandkids before making preparations to move to Atlanta. My parents flew down while I loaded up the minivan for a two day trek. We stopped in Las Vegas to stay at the Circus-Circus. While the rooms were affordable (a must when having to rent two at a time given our family size), I discovered that taking six kids to a large hotel wasn�t the most brilliant plan in the world. We had to park quite a distance from the hotel and made multiple trips back and forth and we hauled up all the necessary luggage and items to our room several stories above the ground floor. We managed to get through the night despite kids moving from room to room and bed to bed. The next morning I got up early and took my oldest daughter, Shayla, with me to go play Bali Hai. Bali Hai is a South Pacific themed course located right on the strip. 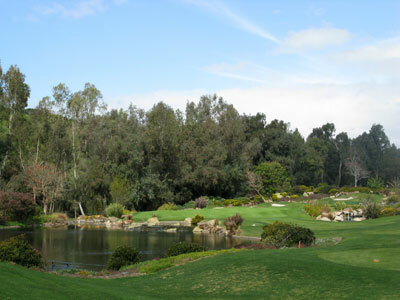 The course is beautiful and has several really good holes with tons of water hazards to contend with. In fact, the only thing that bothered me much was the fact that airplanes were flying over every five minutes or so and the holes along the interstate were a quick reminder that I wasn�t in the South Pacific. Shayla had a blast with her first experience at a non-municipal course and we hurried back to the hotel to catch up with the rest of the family. After eating at the less-than-impressive breakfast buffet at Circus-Circus it was time to load up for the second half of the trek to Southern Cal. DVD players in cars are one of the great inventions that a father of multiple children will ever enjoy. The idea of driving over 30 hours roundtrip in a van stuffed full of young kids, luggage, and my mother-in-law could have become quite intolerable if it weren�t for that 8 inches of LCD wonder. We eventually arrive in San Diego and are thrilled to find our beachfront accommodations. The space is roomy, the views are stunning, and there are several restaurants to enjoy in the area. My parents are only going to be with us for a couple of days and I wanted to get a round of golf in with my Dad while we had a chance. 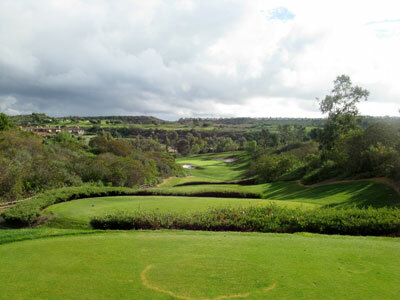 We originally had two rounds arranged but due to the rare heavy rain San Diego was experiencing we had to eliminate Barona Creek from the lineup and play a single round at Grand Del Mar. The Grand at Del Mar is a Tom Fazio layout that is solid, but not stunning by Fazio standards. 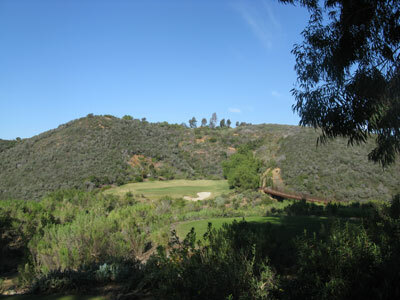 The course features rolling, treed terrain along with some dramatic elevation changes from tee to green. Fazio always does a great job with his bunkering style and The Grand is no different, while the forecaddies assist in reading the generous greens. 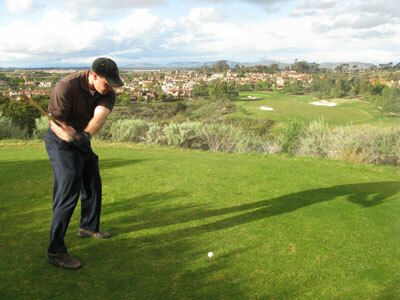 I didn�t play very good that day, but the highlight of my experience was the attention I received on the driving range. I got warmed up with my irons before breaking out my driver. Once I started hitting my driver I started drawing a crowd. A handful of caddies and workers gathered behind me and a few of the fellow patrons started watching. I was in the zone. I was pounding it and some of my shots were leaving the driving range. One of the caddies started teeing balls up for me to hit, making sure they were set just �perfect�, and said, �There are a lot of guys that can hit their driver well, but you murder it � wow!� Admittedly, that is pretty fun to get that kind of attention and appreciation. Two days later we enjoy a full day at Disneyland and California Adventure Park. My Dad, Mom, and I go through the line at the Toy Story�s virtual shooting game numerous times in an effort to beat our previous score each time around. You�d think we were the kids as we jumped off the cart and ran around to get back in line again. Few places on earth can put a smile on the face of an adult and a child all day like Disneyland can. 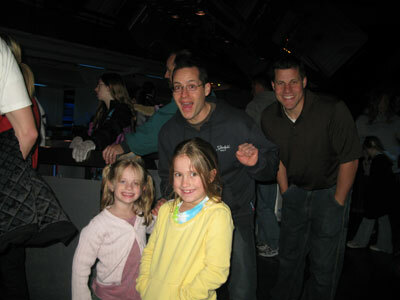 My brother Rick, an amusement park enthusiast, joined us for the trip and was the life of the party. The kids feed off his enthusiasm and he makes it more fun for everyone. The sun rises over the beautiful Pacific Ocean in the morning and it�s time to head up to Carlsbad with the family to attend LegoLand. On our way to the park I get a call on my cell phone. I don�t think much about it and proceed to answer the call and jabber away. The next thing I know I�m getting pulled over by a California police officer on his motorcycle. He proceeds to inform me that speaking on a cell phone will driving is illegal in California and threatens to write a ticket. I plead ignorance since I�m from Idaho and am down on vacation and rarely find myself in California. He is sympathetic to my situation, checks to make sure my kids have the proper car seats, and sends us on our way. We meet Stacy�s sister, Kelli, at LegoLand and proceed to have a great time. It doesn�t have the mystique and charm that Disneyland delivers, but it caters to young kids better than any Six Flags ever dreamed about. In the end, the kids have a blast and run from ride to ride and attraction to attraction until we inform them it is time to go home. The drive that was only a half hour on the way up became nearly two hours on the way back due to the ridiculous traffic situation the California residents call �normal.� The fact that my daughter Anisa left her pressed penny from the LegoLand souvenir machine while taking a �potty break� at Carl�s Jr. didn�t help since we circled back nearly 10 miles to put a smile on a crying face. The ride home goes as well as can be expected with us breaking up the trip by stopping and staying in Vegas on the way home. 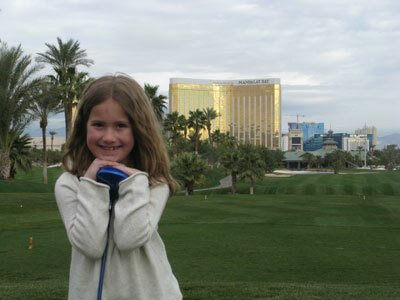 The kids loved seeing Las Vegas lit up at night and I was satisfied with another family vacation where I was able to get some great golf in.